Just finished up a great first week of summer camp. 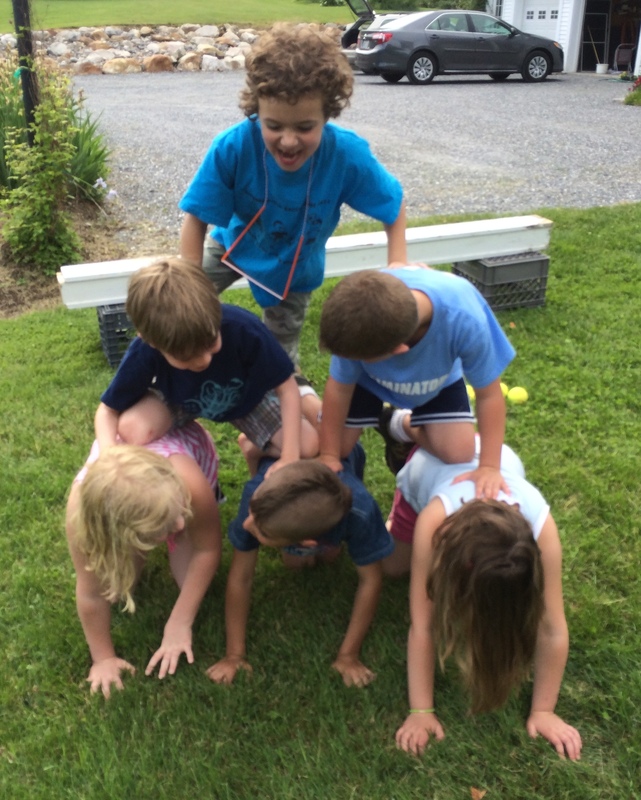 Seven kids, going into 1st – 4th grade joined in the fun. 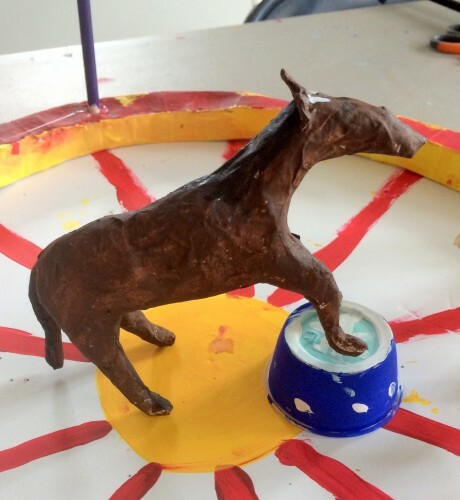 The biggest, and voted most favorite, project of the week were the paper mache animals that we made for our miniature circus arena. 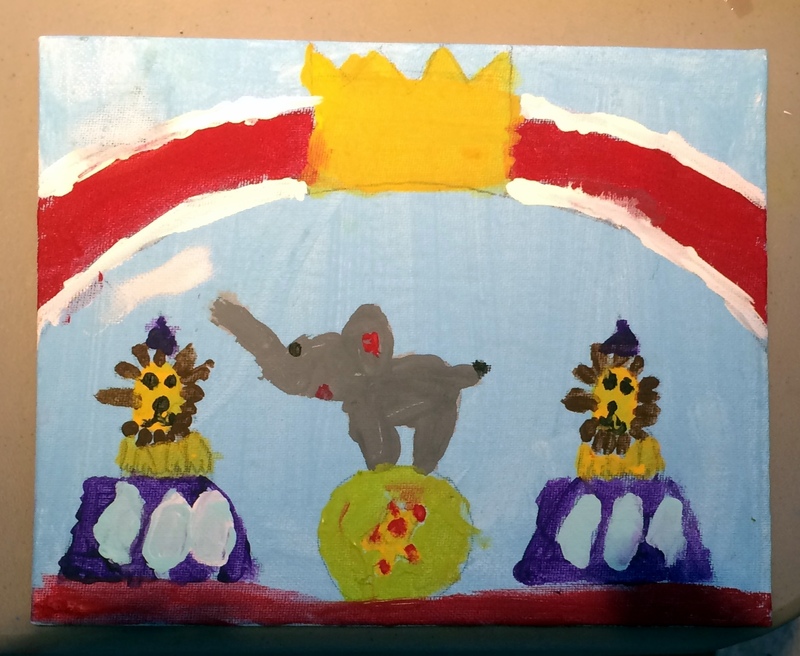 Here is a finished picture of the animals and circus ring. 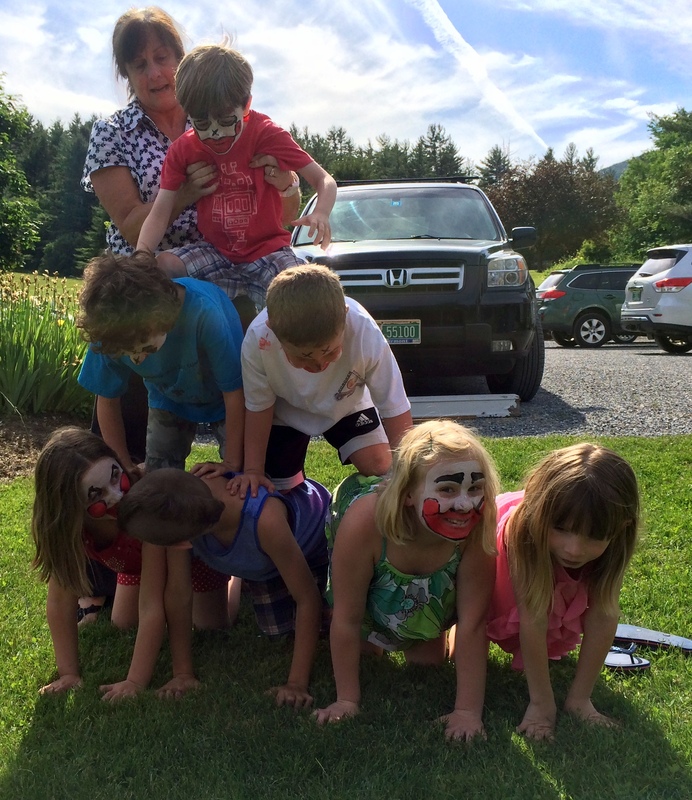 After making the animals, the kids came up with different acts for them to perform. We had two rings of fire made from spools, wire and pipe cleaners, a cannon to shoot a monkey from, a ball for the seal, platforms to stand on, a trapeze and more. It was great to watch their imaginations go wild and work on coming up with workable solutions. 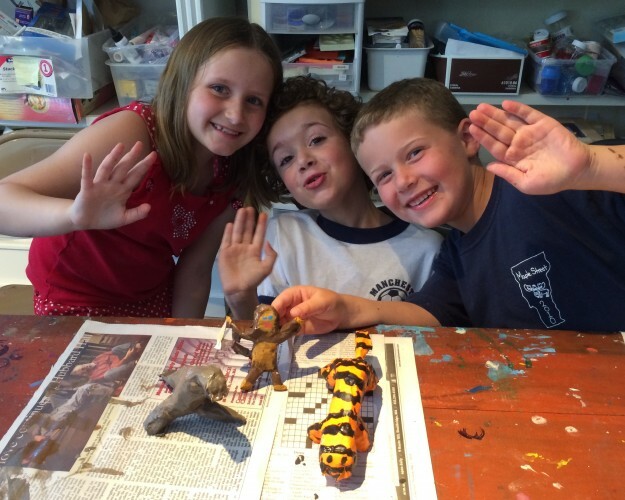 Making the paper mache animals was a difficult project for the kids and they were so proud of the final results. 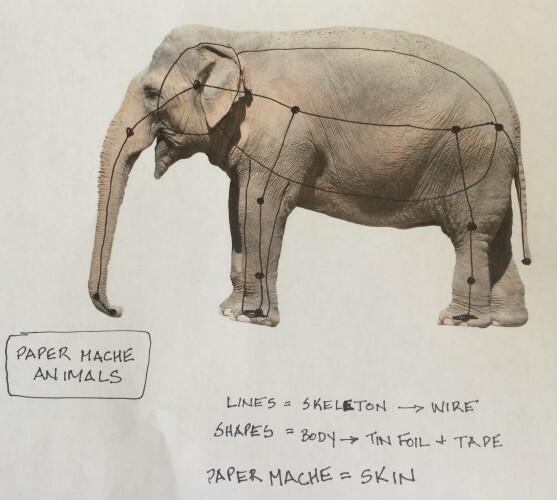 We took a side view picture of their chosen animal and drew lines to show where we would make a wire armature. After making the animal’s skeleton from pipe cleaners, we covered them with tin foil and tape, added 1-2 layers of paper mache, painted and then decorated in circus attire. Here are several pictures of the process and finished animals. 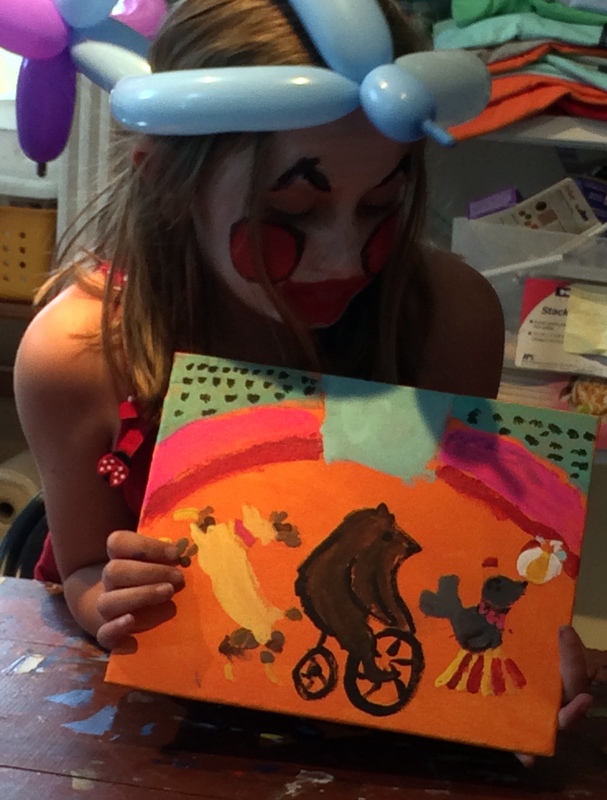 Our other big project of the week was a circus painting on canvas. 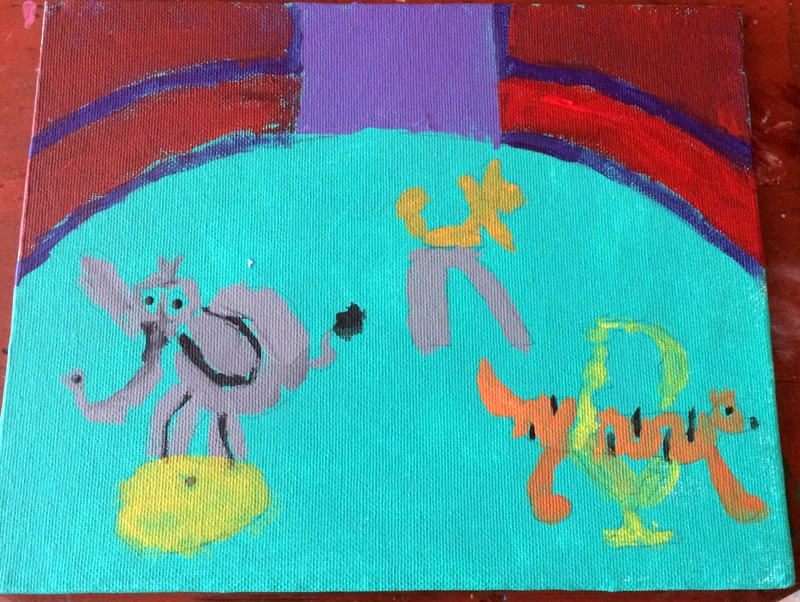 The kids started by sketching several animal acts using pictures from the computer. Their sketches were then transferred to a canvas board and painted. Here are some of the final paintings! We also did several smaller art projects during the week. 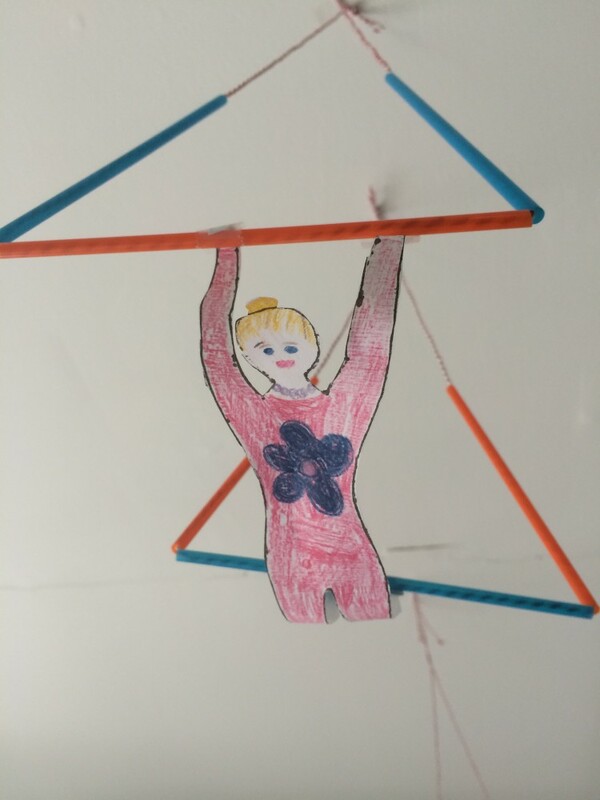 The first is a paper acrobat that hangs from a straw and string trapeze. These looked great hanging from the studio ceiling. 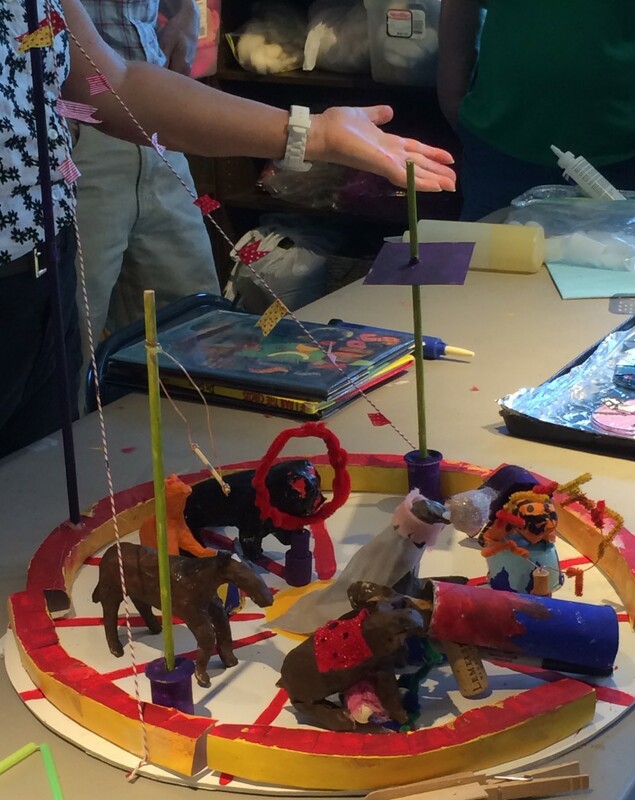 The second one was a paper circus train – each camper created an animal and an embellished car for the train. Here’s a panoramic picture of the nearly 8′ train. 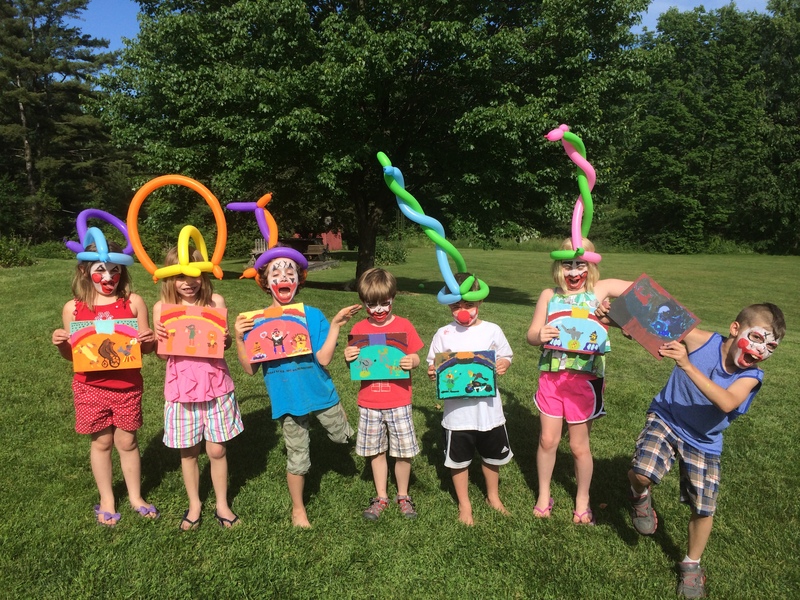 On the last day of camp, the kids turned into clowns with face paint, foam clown noses, and crazy balloon hats and had a show for the parents at the end of the day. Thanks to my great assistant, Claire Ianuzzi, and all the campers and families for a great week. following link to go to this year’s registration form which has all the dates, age groups, and camp topics. Here’s the link: Registration form -Summer camp 2014. 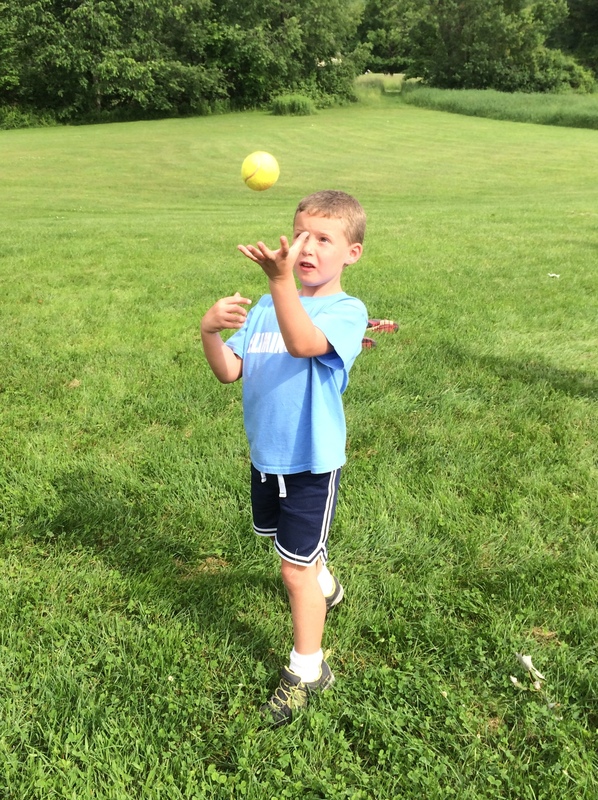 The camp’s enrollments range from 6 – 10 kids so you may want to reserve your spot now!! 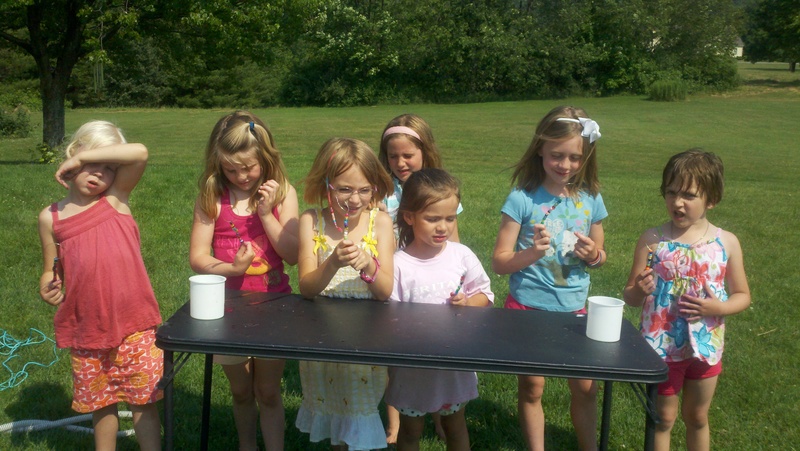 If you want to see an example of what types of activities we offer, take a look at some pictures from last year’s camps. Click here to see the pictures. Your kids are guaranteed to have a great time!! Oh my gosh, camp was fun today. 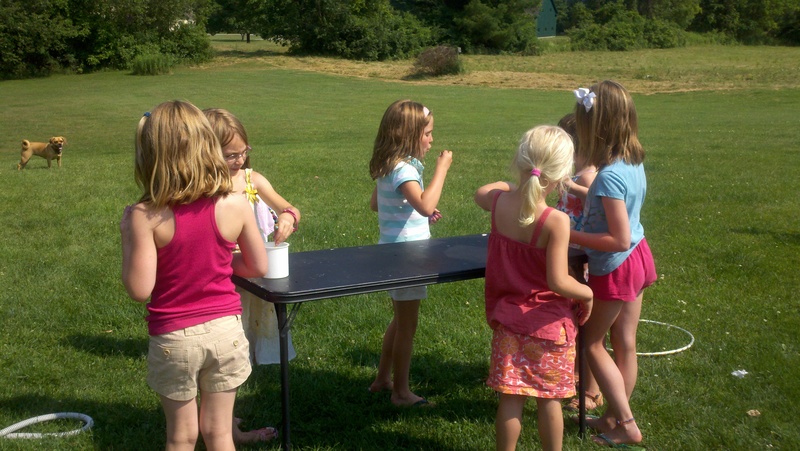 It was a small group of only 3 kids as several campers had to cancel due to the darn stomach bug. We started off on the computer looking at a variety of art about and with food. First, traditional still life paintings that included food intheir arrangement. Then we moved on to the artist Giuseppe Arcimbolda, an Italian painter from the late 1500s who painted portraits made entirely with the images of fruits and vegetables. He was way ahead of his time. Click here to read about him and his art. Then, we looked at the work of Carl Warner, a british photographer, who uses real food to create his landscapes- think a sea of salmon filets, a broccoli tree, mountains of bread. Click here to see his interesting art. Then we looked at the mini food sculptures of Shay Aaron, most of which is made with polymer clay. You can see it here. In addition to artists, we talked about how chefs could be artists in their preparation of food. Could the taste of the food they created, in addition to its presentation, be considered art? I think so. I am all for a broad definition of what constitutes art. I also showed the way that people have made sculptures with food and have made creative presentations of food. Look here and here for some fun examples. My original planned projects were making cardboard tube popsicles, a fun, quick project, and Wayne Thiebaud inspired pastel paintings. Both of these could be considered pop-art projects. Here is a picture of the kids with their popsicles. For our Wayne Thiebaud paintings, after looking at his work, the kids each picked up what item they would like to use. They drew their items in pencil onscrap paper until they were happy with the image. Then were used graphite paper to transfer their image multiple times onto some nice art paper. They colored their drawings with pastels and we added some highlights and shadows to finish. I think they turned out great!! These are two first graders and one second grader!! Finally, the one other food artist I showed the kids at the beginning of class was that of Micheal Breach who makes drawings in the frothed milk of lattes. You can check it out here. 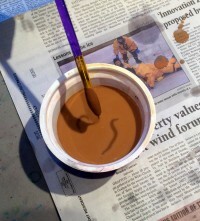 When Emma was working on her chocolate/vanilla cardboard popsicle, she discovered that she could simulate the latte and milk in the container that the used to clean her paintbrush. 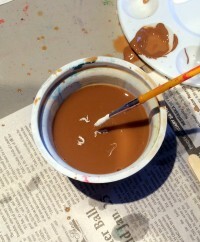 First, the water became brown like coffee and then she cleaned her brush of the white paint and it swirled around the top. After showing us her container, we all decided to try our hand at simulated latte milk art. What a hoot! 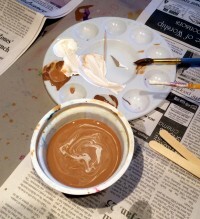 I especially loved that we could learn about art and add some experimentation and silly projects in the schedule. Just finished up our first day of camp. Today’s catchy theme was Buildings, Bungalows and Barns. One of my favorite things about teaching is coming up with the lesson plan and trying out different projects. I usually start by making a list and brainstorming about a topic. It’s rather a mish-mash of terms, ideas, artist names, and other things, but I have a blast looking online into differentideas and seeing where it takes me. For example, here is what is written on my pad of paper for today’s camp. Architecture – famous architects & different styles of buildings. Blueprints. Why buildings might be different in different parts of the world and in different climates. Hundertwasser – unusual buildings. colorful buildings. Nomadic vs. permanent buildings – igloos, yurts, tee pees… Building a fort in the studio? making an igloo with sugar cubes? ice cube igloo? Cities vs. rural buildings, definition of bungalow, barns – painting of barns…. bungalows – what is a bungalow exactly…. a time lapsed video of family building an igloo in their backyard with 200 blocks of colored ice — very cool!! You can see it here on yahoo news. For barns, I was thinking about hex signs and then found that some people make a large wooden “barn quilt” to decorate their barns. Maybe for a project we could design a paper or painted barn quilt to put on a drawing of a barn. You can click here to see a slideshow of some of these great barn quilts. For people that know me, they know that quilts and all things fabric/fiber are very dear to me. Quilts are also such a good art/math project for kids – another favorite of mine. Images of unusual architecture – yes, there are some strange buildings out there. Here’s a slideshow of some that we looked at today. While looking at these architectural pictures, we talked about some of the features of buildings, such as windows, doors, chimneys, roofs, shutters, porches, steps/stairs. I then showed them our first project – making a pop-up 3 dimensional building. 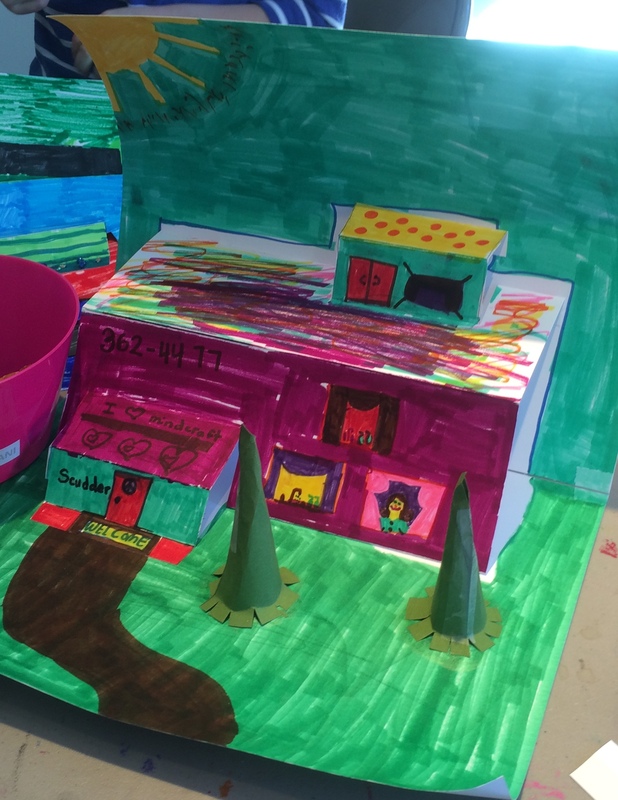 The pop-up idea was pretty tough to grasp at first, but everyone figured it out and then did a great job of coming up with their own ideas of what things they wanted on their building and in their front yards. 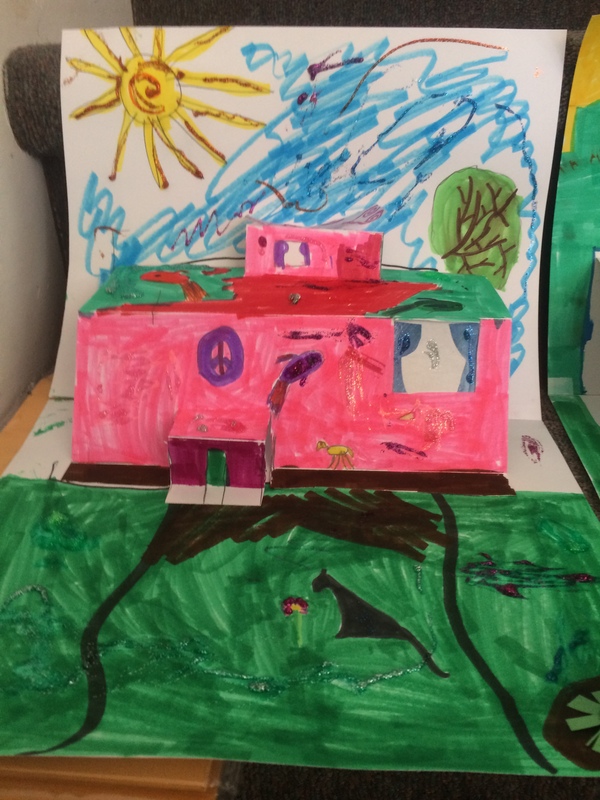 Here’s Lilly glitterizing her 3D house. Here are several other pictures of houses. Our second project of the afternoon was a quick, but fun, one. We folded a piece of paper in half the long way. 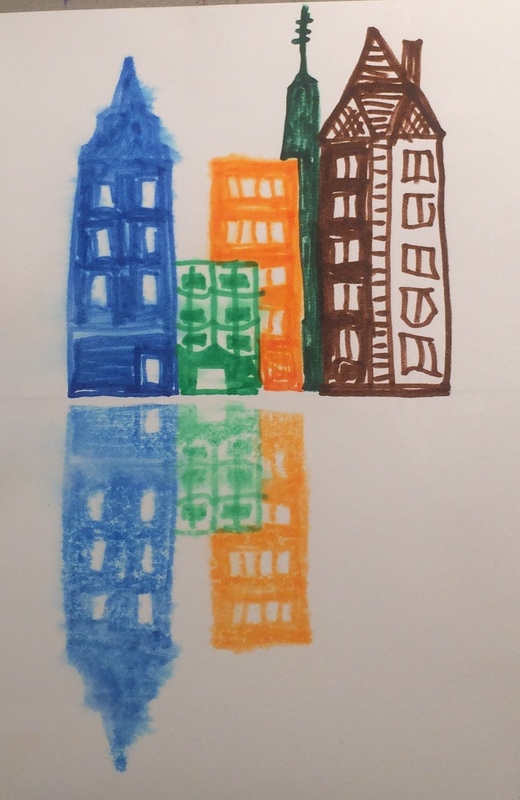 Drew a cityscape above the folded line with markers. Then we painted the bottom half with water, folded over the top half with our drawing, and rubbed the sides together to transfer the cityscape to the bottom. The kids were very excited to open up their papger and see their cityscape’s reflection. Unfortunately I didn’t get any pictures of the kid’s projects, but here is my sample. As you will see, only the first three building on the left have been transferred. I later added the buildings to the right when demonstrating to the class. This project came from a blog named Art Class Ideas. Being the first of August, I thought it was high time that I write about the five weeks of camp that have already happened this summer. I think I can fairly say that they have been an overwhelming success!! The projects have been awesome, we’ve had lots of fun playing outside (especially with the new slip and slide) and snack time is always a favorite. The feedback from campers and parents has been fantastic. I, also, have had a great time teaching them and am so happy to be able to do them here at my home and studio. It has added a real special aspect to the camps that isn’t possible when the camp is held at a school or non-profit institution. 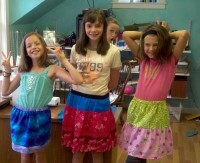 The first camp of the summer was my Recycled/Nature Art Camp. 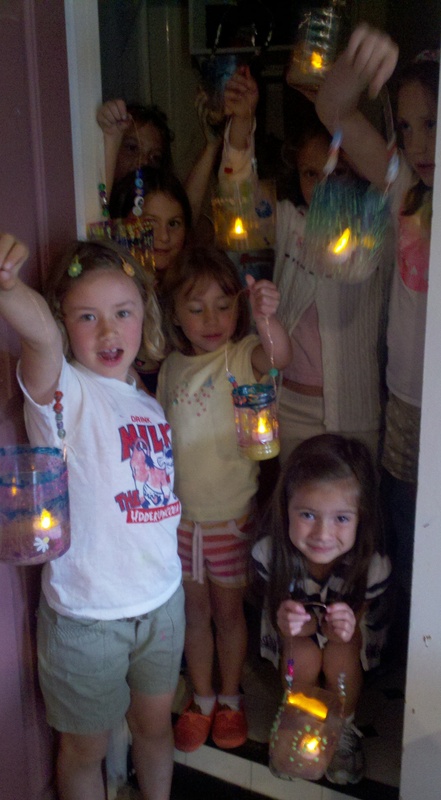 Here are some pictures of the lanterns we made from recycled water bottles. We cut off the top and painted them with glass paint. Then we made a handle with wire and beads. To finish, we put in about an inch of sand and an electric candle. Here, the kids all tried to cram into the windowless studio bathroom to see what the lanterns would look like in the dark. …and one of my favorite recycled projects is making sculptures with the cornstarch based packing peanuts. Stick the end of one onto a damp paper towel and then you can stick it to another one. Here, Taylor has made a cool pair of glasses with them. Success! Finally finished my Summer Camp brochure. While the camp schedule has been out for a while (one camp is even full), it took me awhile to get all the finishing touches on the printed copy. Here is a link to the pdf for both the brochure and its registration form. Word of mouth is the best way I have for introducing families to my programs. It would be great if you would pass the camp information on to any friends who have kids in the age range of 3 1/2 to 12. I have a new class of 4 homeschooled children, ages 4-6. In our first class, we spent time looking at a color wheel and then I showed them how you can mix the three primary colors ( red, blue and yellow) to make the secondary colors (orange, purple and green). We then took several 4″ squares and drew black crayon lines – one diagonal from corner to corner and one from a different corner to the middle of the first line. It ended up having two small triangles and one large triangle. We painted two different primary colors on the two small squares and then mixed them to paint the secondary color onto the large triangle. After all the squares were painted, we put them together to make a little paper quilt. The kids loved it!! They also got really excited to find out that they could make other shapes – squares and diamonds- by moving the squares around. See the big purple and green diamonds and the two small red ones? This was also a great introduction in learning how to use watercolor paints, in cleaning your paintbrush, We even got to practice a few math skills with the quilt shapes. Postponed until Saturday, November 10. Times are the same. 1-3 pm or from 6-8 pm due to the weather forecast. This Wednesday, November 7, come Create with Bogate and help with Hurricane Sandy relief. I will be offering two workshops, from 1-3 pm and from 6-8 pm for women to share community, make something handcrafted and help those impacted by Hurricane Sandy. For only $20 (and a tee-shirt which you probably already have) , you can make a way-cool tee shirt for yourself, hubby, friend or kids. You will learn to make my twist on the wildly popular bleach pen tee shirts which removes the color of the tee shirt into any design that you can imagine and draw. I will be donating half of the workshop fees to Heartworks to specifically help with Hurricane Sandy relief. Space in Stacy’s studio is limited so please call her at 362-5608 or email her at stacy@bogate.com to make a reservation. Drop-ins are welcome though and I will fit you in if there is room. Here is an old tee shirt that I recently doodled on. Pretty cool, huh? You can also do a simple design such as a heart, peace sign, flower, butterfly, bird, robot……. I will have a variety of examples and templates to help with the design process. To see more more examples of shirts that people have created, click here. I think these would make great gifts too. So, bring some extra shirts if you want and doodle away for only $5/shirt. We will be using bleach, so if you are sensitive to it, this is not the event for you. I will have an alternative product that doesn’t have bleach in it, but the bleach smell will still be present in the room. It’s amazing what we can accomplish in 15 hours of dedicated art making activities. In addition to the projects that I wrote about in the previous 3 posts, we completed about 6-7 additional projects. I only have pictures of several. For painting, we learned about monochromatic color schemes, we practiced making tints and shades of one color and then made an abstract monochromatic painting trying to use different tints/shades in each contiguous section. For a pretty advanced concept and project, they did great! We also painted some book pages with liquid watercolors and made a landscape collage adding details with markers. 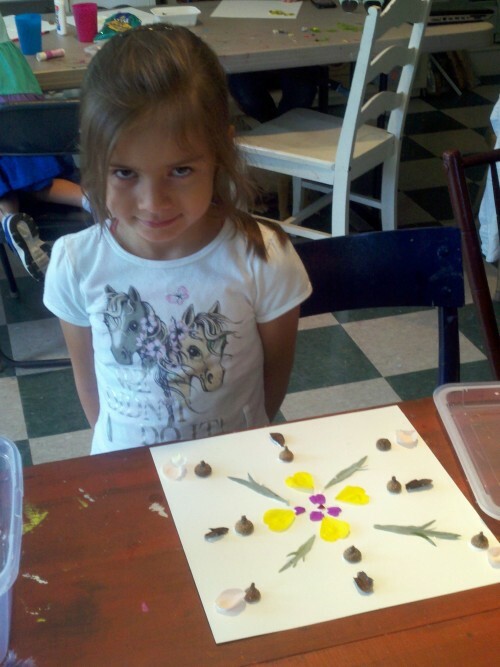 We learned about symmetry and made very colorful shrinky dink butterflies. We glued them on branches, added some silk flowers, and then stuck the branches into some air dry clay to make a butterfly tree. For sculpture, we used toothpicks and mini marshmallows to create different structures. The heat did not help our structures stay upright. The dogs also ate all the marshmallows, both in the bag and on toothpicks, that night destroying the hard work of any projects left behind that day. The last project that I took a picture of was our rendition of the famed glassblower, Dale Chihuly’s “Macchia” series of glass vases. I found this project idea on Pinterest and it turned out awesome. The only thing I would do differently is to go on a field trip to see actual glass blowing. The kids couldn’t quite fathom how glass could change so much from the video we watched. 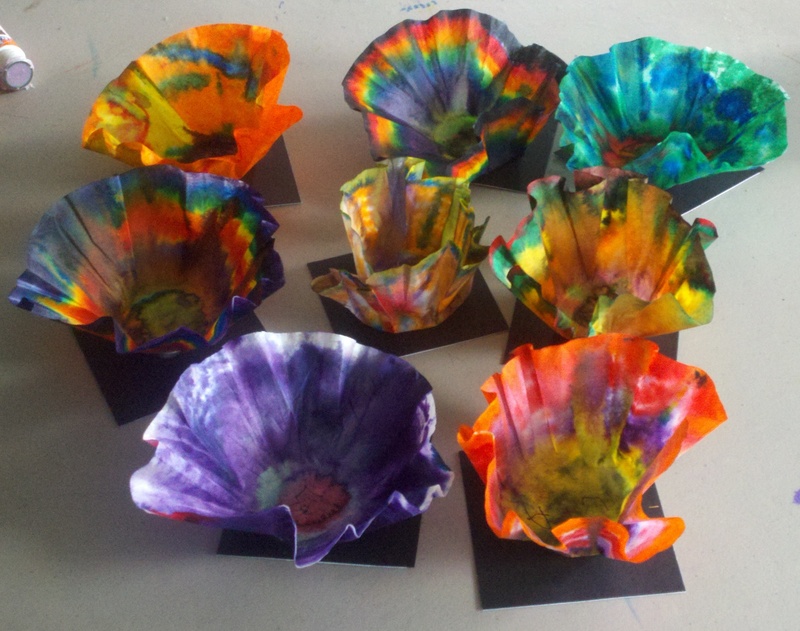 Anyway, here are our “Macchias” made from coffee filters, washable markers, and spray starch.